Singapore's National Environment Agency ("NEA") uses the Pollutant Standards Index ("PSI") together with the National Ambient Air Quality Standards developed by US Environmental Protection Agency. As the haze in Singapore started to worsen, NEA published the 3-hour PSI readings from 6 a.m. to midnight and the 24-hour pollutant concentrations three times daily. PSI is determined from the concentrations of the following five pollutants (measured in micrograms per cubic metre): respirable particulate matter, sulphur dioxide, nitrogen dioxide, ozone and carbon monoxide. The concentration of each pollutant is then converted to a PSI sub-index ranging from 0 to 500.
using the 1-hour ozone concentration. The PSI reading is the highest of the five PSI sub-indices. The PSI is not a composite or an average of the five PSI sub-indices. Reporting the air quality as determined by the level of the single worst pollutant has been criticised. Multiple pollutants affect our health at the same time, and the possibility of joint impact of different air pollutants on our health should not be ignored. Reporting the air quality by adding all the sub-indices may over-represent the total health effect, as it assumes that the effects of each pollutant are independent of the others. Some pollutants may have synergistic effects, while others may have opposing effects. When Chairman of the Haze Inter-Ministerial Committee Minister Ng Eng Hen referred to a hypothetical situation in which haze readings soared far beyond the level considered hazardous e.g., a PSI reading of nearly 800, he was mistaken. The highest possible PSI reading is 500 and the highest risk classification is hazardous. Hazardous means dangerous and involves potential loss or injury. Why No 1-hour PSI Reading? Many people wondered why NEA did not publish the 1-hour PSI figure, which they considered to be as real-time as they could get. The Government's answer was that the effects of human exposure to pollutants are based on a "continuum" rather than a "threshold", involving factors such as the length of exposure, the density of the pollutants and individual variation. Besides, even the 3-hour PSI reading was too volatile and that the 24-hour PSI reading was more relevant to a person's health. The Government's position is correct, but only when taken in limited context. If a person is considering whether to live in a certain town or (if he lives there) whether to relocate, the 24-hour PSI reading is relevant. In addition, he will want to know how often the 24-hour PSI is in the healthy, moderate, unhealthy, very unhealthy and hazardous range. If a person works outdoors, both the 24-hour and 3-hour PSI readings are relevant, especially if it is obvious to him that the ambient pollution is worsening rapidly. If a person spends most of his time indoors and is thinking about whether or not to venture outdoors for a bit of quick shopping, the 1-hour PSI reading is relevant. If a person is thinking about whether or not to go for a jog outdoors, the PSI is of little relevance. What is important to him is the PM2.5 (respirable particulate matter 2.5 microns or smaller per cubic metre) reading. The Government may also be concerned about how companies and workers should respond when the 1-hour PSI readings fluctuate wildly. Should outdoor work be subject to stopping and starting every hour? However, the health of everyone is paramount, and possible interruptions to outdoor work is secondary. Respirable particulate matter is the most elevated air pollutant from forest fires. Particulate matter in the environment is a complex mixture of substances with diverse chemical and physical characteristics. While their potential to cause injury varies with size and other physical characteristics, chemical composition and source, they are generally classified by their aerodynamic properties, because these determine transport and removal processes in the air and deposition sites and clearance pathways within the respiratory tract. The aerodynamic diameter is the summary indicator of particle size as it is a critical determinant of the likelihood and site of deposition within the respiratory tract. By definition, PM10 includes PM2.5 and thoracic coarse mass PM (or "coarse" mass PM). 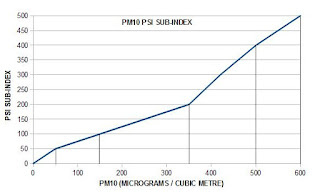 PM10 includes those inhalable particles that are sufficiently small to penetrate to the thoracic region; the fine fraction of PM10 is cut off from the coarse fraction at 2.5 μm in aerodynamic diameter (PM2.5), a size fraction with a high probability of deposition in the smaller conducting airways and alveoli. The fine particles are absorbed by the body. Exposure to fine particle pollution can cause premature death and harmful cardiovascular effects such as heart attacks and strokes, and is linked to several other significant health problems. People most at risk include people with diseases that affect the heart or lung (including asthma), older adults, children, and people of lower socio-economic status. Pregnant women, newborns, and people with certain health conditions, such as obesity or diabetes, also may be at increased risk. Having determined that the annual fine particle standard set in 1997 was not adequate to protect public health as required by law, U.S. Environmental Protection Agency on 14 December 2012 strengthened the annual fine particle standard by revising it from 15 μg/m3 (micrograms per cubic metre) to 12 μg/m3 i.e., an area meets the standard if the three-year average of its annual average PM2.5 concentration at each monitoring site is not more than 12 μg/m3 . The 24-hour PM2.5 remains at 35 μg/m3. An area meets the 24-hour standard if the 98th percentile of 24-hour PM2.5 concentrations in one year, averaged over three years, is less than or equal to 35 μg/m3 . In the light of EPA's standards, we should take precautions to protect ourselves if the 24-hour PM2.5 reading is 35 μg/m3or higher. Note that NEA considers 24-hour PM2.5 of up to 40 μg/m3 to be healthy. Singapore's average annual 24-hour PM2.5 in 2010 and 2011 was 17 μg/m3. The data for 2012 are not available. Many people have been wondering why the 3-hour PSI reading published by NEA sometimes does not quite match their own visual and/or olfactory (i.e. smell) assessment of the haze. There are at least four reasons. First, the 3-hour PSI is measured over a period of 3 hours. So the real-time PSI may differ significantly from the 3-hour PSI if the real-time PSI is rising or falling rapidly. Second, the 3-hour PSI is the average for the whole of Singapore and may be different depending on where the person is. Third, as mentioned above, the PSI is not a composite or an average of the five PSI sub-indices. 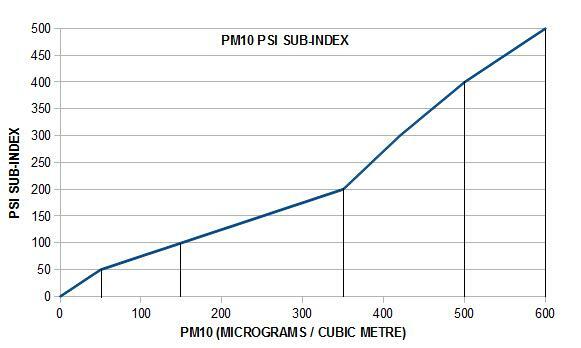 Fourth, the relationship between PM10 and PSI is linear between "break points" but not a straight line for PM10 values between 0 and 600, as may be seen from the chart below. Instead of acceding to requests by the public for 1-hour PSI readings, NEA decided to publish the 24-hour PSI, PM10 and PM2.5 readings every hour from 21 June onwards. These are rather irrelevant and pointless, for reasons mentioned above. What did the Government or NEA not understand about the public's desire for 1-hour pollutant readings? In the absence of the 1-hour PSI, PM10 and PM2.5 readings, what we should do is to observe the 3-hour PSI readings and whether they are rising or falling. If the 3-hour PSI reading is rising, the 1-hour PSI reading is likely to be higher than the corresponding 3-hour PSI reading; and the faster it is rising, the greater the difference between the 1-hour PSI and the 3-hour PSI. Conversely, if the 3-hour PSI reading is falling, the 1-hour PSI reading is likely to be lower than the 3-hour PSI; and the faster it is falling, the greater the difference between the 1-hour PSI and the 3-hour PSI. A note of caution: before the 3-hour PSI stops falling and starts rising, the 1-hour PSI will be higher than the 3-hour PSI (in order to reverse the downtrend); unfortunately, we do not know when the 3-hour PSI has stopped falling until after the fact (just like the stock market) so it may be prudent to assume that the 1-hour PSI is the same as the 3-hour PSI when the latter is falling. Obviously, even if the 3-hour PSI reading is falling but is still in the unhealthy region, for example, above 200, it's better not to be too aggressive with our guesstimate of the 1-hour PSI. And, if you have any doubt, stay safe and remain indoors or if you have to go outdoors, wear an N95 mask properly. The Government should listen to the people and publish the 1-hour PSI, PM10 and PM2.5 readings. 1. NATIONAL ENVIRONMENT AGENCY Computation of the Pollutant Standards Index. 2. WONG TZE WAI et al A Study of the Air Pollution Index Reporting System 27 Jun 2012. 3. Govt Prepared Should Haze Soar Beyond Hazardous Levels: Ng Eng Hen channelnewsasia.com 23 Jun 2013 7:56 p.m.
4. Refer to 24-Hour PSI, Not 3-Hour: Ng Eng Hen channelnewsasia.com 21 Jun 2013 8:32 p.m.
5. Talking Point: The Vote Special — The Haze Channel News Asia 20 Jun 2013. 6. WORLD HEALTH ORGANISATION Air Quality Guidelines Global Update 2005. 7. ENVIRONMENTAL PROTECTION AGENCY Particle Pollution and Health 14 Dec 2012. 8. ENVIRONMENTAL PROTECTION AGENCY Revised Air Quality Standards for Particle Pollution and Updates to the Air Quality Index 14 Dec 2012. This article was last updated on 27 June 2013, 12:05 p.m. Excellent piece. You say that the government should listen to the people but as one Minister has said they are "deaf frogs".Seriously the answer to your statement is that we should start from first principles of government. The mandarin system put in place by LKY and paying the mandarins obscene wages guarantees a collegiate spirit amongst themselves. You do not criticse each other; you scratch my back and I will scratch yours; never admit your mistakes or the golden rice bowl will be broken; since you are touted as the best Singapore has to do the job, as the PM has said in his recent BBC interview (but censored by the MSM)how could you listen to the people? Impressive article! Thank you for enlightening with the technicalities of the PSI calculation. Interesting blog and i got a good knowledge to read your informational post. thanks for creating this blog.